Congratulations to our newest USTA Southwest Adult League champions, and good luck at the USTA League National Championships!! 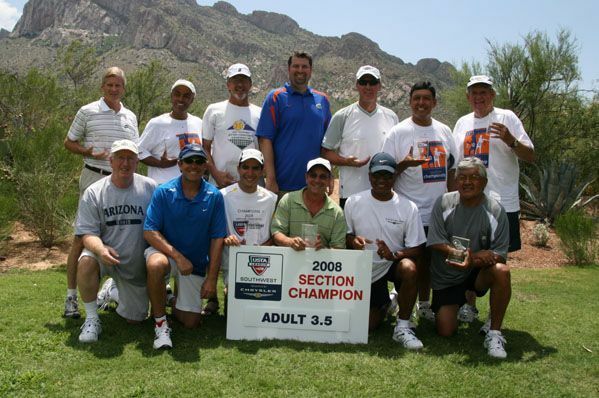 Nearly 600 players from 44 teams made their way to Tucson, Aug. 1-3, for the USTA Southwest Adult League Section Championships presented by Chrysler. When the dust cleared, three Central Arizona teams claimed Section championships crowns and earned qualifying spots in USTA National League Championship events held in September and October. In 3.5, the men's team from Central Arizona (Mesa) eked past a fellow Central Arizona squad (Sun Lakes) to claim the Section Championship. Both CAZ teams finished with 4-1 records in pool play, but the Mesa team advanced on matches won. 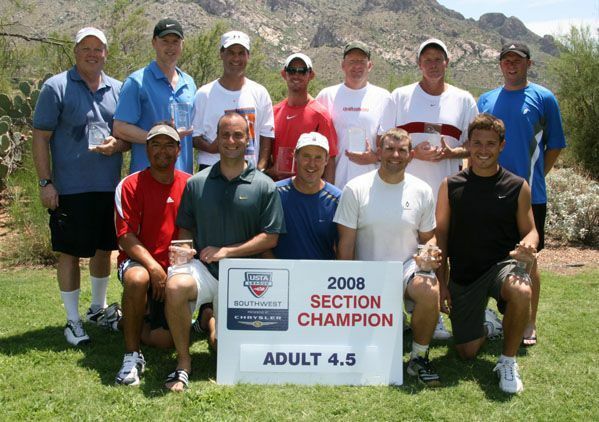 East Valley Tennis & Gene Autry Sports Complex - Mesa, Ariz.
Captain Jerry Von Teuber, Michael Gerard Thompson, Billy F. McDaniel, Oscar A. Oliden, Kevin Egan, Robert Sean Justice, Chris Austin, Richard Taylor, Robert Clarkson, Mauricio Leon, Rodolfo Thomas, Bryan Patterson, Carey Wilcox, Steve Dzielak, John Homer, Jeffrey Clark. Central Arizona teams claimed both the men's and women's events in the 4.5 division. Captain Mike Flinn, Joseph A. Martinez, Randy Blanchard, Eric D. Engstrom, Clay B. Taylor, Cameron Drummond, Philip Hammond, Troy B. Wethe, Mitchell Katz, Dan Maggio, Andrew R. Vancott, John Heidmiller, Jon M. Weiss, Brian Knebel, Stuart Mc Nicol, Keith Cahill, Paul F. Wenz. Captain Heidi Nikodemus, Catherine Ellington, Diana H. Romero, Nadine Leduc, Heidi A. Nikodemus, Amy D. Grimes, Pam Ponwith, Ellen Baumann, Maureen Harmon, Robin Parmley, Rebecca A. Opoien, Ann Marie Anderson, Tracey Kiest, Kristin Morgan.